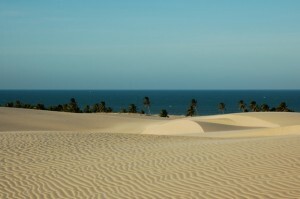 Travelers can spend days driving a buggy on hundreds of different beaches, and enjoying in the drive over untouched sand dunes and see Brazils glorious coasts. Its amazing eastern coast has kilometers and kilometers of great beaches. Some of them are 20km long and backed by huge dune areas piled up by the coastal winds, and the others are small palm-lined bays. Brazil offers everyone a great choice of beaches. Particularly the east coastline is one of the most beautiful in Brazil. There are salt flats, palm-lined beaches, cliffs of colored sands, reefs, beaches with freshwater lagoons, rolling dunes and tiny traditional fishing village. Travelers who have time can make a fantastic trip of approximately 700km along the shores of this eastern Brazilian coast with their beach buggy. You can travel in both directions. The trip may take three to five days and you will pass around 90 beaches. This trip requires an experienced driver, so if you aren’t one, you should find some skilled driver. Cumbuco Car Rental can help you with that task. In this trip you will drive through the small rivers that flow into the ocean, uneven tracks, soft sand and some beach parts at low water level. Locals Brazilians will help you to ferry the buggies on rafts over the wide river mouths. Also, always check the weather before attempting such a long trip. And please do not ruin the beach vegetation.